Tourism in Ireland is one of most vibrant sectors, and recently played a leading role in the country’s economical renewal. 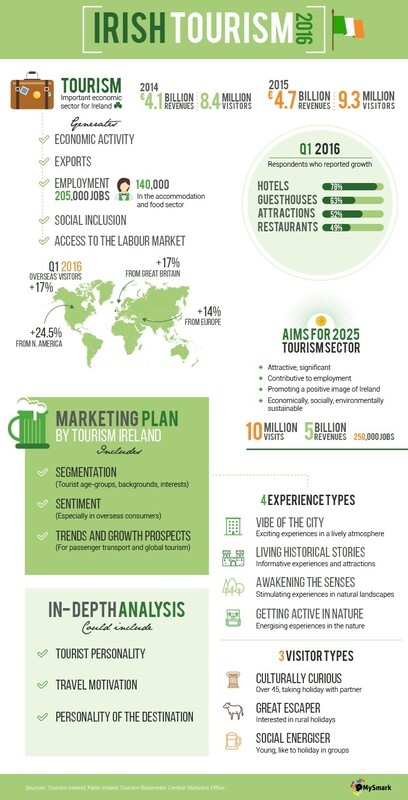 In the last 3 years there has been a significant growth in terms of tourist flow, due to the rich and diverse Irish touristic product that holds the potential to be one of the most attractive destinations in Europe. Overseas tourist visits to Ireland in 2014 grew by 6% to 7.1 million: combining the data from the domestic market and international visitors, overseas tourism revenue for the economy was around €4 billion. In 2015 9.3 million people visited Ireland, while the First Quarter of 2016 welcomed a strong increase in overseas visitors (17%). Great Britain remains the Country’s largest market for overseas tourism, while North American grew . Total earnings grew by 17% to €5.53 billion. These numbers are expected to grow, and in order to ensure that the sector continues to grow in a sustainable manner, a clear strategy by Tourism Ireland is already in place. By 2025, the major Tourism board expects 10 million visits, while revenue from overseas tourists will increase to 5 billion. Different actors will contribute to the development of the sector, increasing its attractiveness, sustainability, and capacity to generate employment (from around 200.000 to 250.000 jobs). In order to create desire to travel and meeting visitor expectation, an accurate operation of visitors segmentation and sentiment analysis is currently being developed.